Sabah offers almost everything, from wildlife and nature, cultural attractions and festivities, and sports, to beaches, sun, and sea. Sabah’s key attractions include a climb up Mount Kinabalu, trekking, and a canopy walk in the virgin rainforest of Danum Valley, a visit to an orang utan sanctuary, a trip to the turtle island, and diving and snorkelling in one of Sabah’s marine parks, such as Tun Sakaran Marine Park. It is quite easy to visit many Sabah attractions during a Borneo holiday. Sabah’s wild life and nature is unique. Sabah is home to Mount Kinabalu and the Danum Valley conservation area, where a unique flora and fauna can be found. 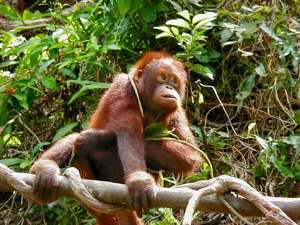 Orang utans, proboscis monkeys, green turtles, and other endangered species are all native to Sabah. The rafflesia can be found in Tambunan. Sabah is home to many different ethnic groups. The largest ethnic groups are the Murut, Kadazan/Dusun, Bajau, Chinese, Indonesians, and Philippinos. A visit to a longhouse, a cultural festival, trip to a traditional market are just some of the cultural highlights. There is plenty of accommodation nearly everywhere in Sabah catering to almost every budget. Kota Kinabalu and the nearby area offer attractive resorts, business and leisure hotels, as well as inns, guesthouses, backpacker hostels. There may also be opportunities to stay with a local family as part of a home-stay program. People is Sabah love food and there is a good selection of restaurants serving local food or international cuisine. Like everywhere else in Asia, there are also food markets with stalls serving local delicacies. There is ample nightlife in Kota Kinabalu. Most hotels have bars that cater to visitors and locals alike, as well as numerous bars in the centre of town. Sabah offers great sports facilities, including diving, jungle trekking, water rafting, mountain biking, and golf. Sabah’s international airport is outside Kota Kinabalu. Several international airlines, primarily originating from South East Asia fly to Kota Kinabalu. Taxis can be hired from the airport, and hotels can also offer a pickup service. Some tour operators may include airport pickup. Getting around is mainly by plane. For short distances taxis may be the right choice of transport, and for the budget traveller there is a good network of buses available to key destinations. Car hire may be arranged. There is a small rail network running from outside Kota Kinabalu to Tenom. Best time to travel to Sabah is during the dry season, which is usually from April to October. However rain may be expected during the entire year. Although Sabah belongs to Malaysia, visitors from Malaysia have to pass immigration upon arrival. Most visitors from European countries, Asia, Australia, and the USA will probably be entitled to a 3 months visa on arrival. Vistors may however be asked to provide evidence of sufficient funds and a valid return airline ticket. Work visa will only be issued prior to departure. Best is to check with the Malaysian Embassy or High Commission before travelling. Tourist and travel information can be obtained from the international representations or local tourist offices of Tourism Malaysia or Sabah Tourism.